Snacking + Texting + Driving = ? If you're looking for a silver lining, about the best you could come up with is at least this latest collision took place when there were no passengers on the trains. However, three Metro workers were injured slightly, and, according to Metro, one car won't be able to be fixed in yet another ding to Metro's dwindling supply of rolling stock. Eight-car trains, at this rate, will be an even rarer sighting.. The Post is reporting the damage at $9 million, another substantial blow to the budget gap. Apparently, that big safety "shake up" a couple of weeks ago didn't magically solve all the problems. Then again, did anyone really think it was anything but a reshuffling of the deck chairs? Maybe it's time for another standard trick, the ol' "safety stand down." That'll fool 'em. Then again, maybe not. Less than 10 days after the last one, a WMATA subcontractor was electrocuted on the job. Metro often whines about its poor public image, once going so far as to blame passengers. While we've documented many sucky passengers on this blog, passengers don't collide trains. Perhaps if Metro made some real changes, like making its management and operators publicly accountable when something goes awry, the "reputation deficit" might start to turn around, but instead Metro appears to persist with the smoke and mirrors routines, and that's just not going over so well these days. OK, so there's no stuffing yet, but hey, it's probably not rush hour. Have a great holiday. Back Monday. 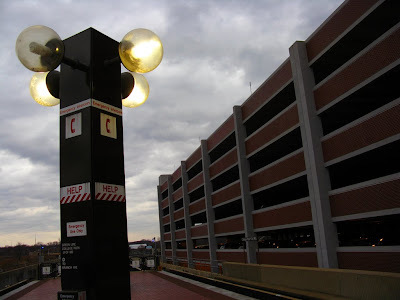 $38,000 seems pretty expensive to light up one small area, but the best part is this: "Metrorail stations have 73,836 lights. Many of them are impossible to reach from the platform. Metro has to stop the trains to allow workers to replace a bulb along the granite platform edge. " So WMATA was poised to enact some major, wrenching changes to SmartBenefits with very little notice to those who would be effected, but in the end, they opted to punt it back a year after giving everyone a good scare. While they're figuring out how to conform to IRS regulations regarding transit benefits, perhaps they could undertake what would seem to be a much more simple task that would actually help customers: enabling anyone to add money to their SmarTrip over the Internet. The issue is on the table, but, like SmartBenefit changes, keeps getting pushed back. Being able to add fare online would not only provide greater convenience to passengers, but it would also stem situations like this. I recently started driving to work because Metro-ing was wasting such a ridiculous amount of time. It took an hour to ride the Orange Line then transfer to the Blue Line to get to Braddock Road. Driving takes 15 minutes, 17 on a bad day. But the other day, I decided to Metro since I had to go into DC after work. I took my farecard and swiped it at my home station, Virginia Square. With only 70 cents, I knew I would need to add fare before making a return trip. When I arrived at the Braddock Road station, I didn't have enough fare to exit the station (duh). 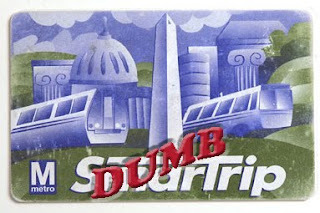 Thankfully, "a SmarTrip® card will let you take one trip that results in a negative balance, but value must be added before it can be used again on Metrorail or Metrobus," a quote from the MetroOpensDoors Web site. To prepare for my trip home, I approached one of the two fare machines at the Braddock station and attempted to add fare. After choosing the amount and swiping my credit card, the machine told me my transaction had been canceled. I proceeded to the other machine, and the machine did the same thing! Me [perky, having had two cups of coffee]: Hi there! Are these fare machines working? I need to add money to my SmarTrip. Him [Looking irritated - how dare I interrupt the ever-important conversation he's having with the other operator in the booth]: No, they aren't working. None of them are working. Me: None - as in, this problem is station-wide? Me [irritated, now thinking "Would it be so hard for one of these two able-bodied men to put up a sign so a to inform Metro's waning ridership of this epidemic? "]: Well, how am I supposed to add fare? Him: Get it somewhere else. Or get cash. Or try later. Geez. Thanks. Get it somewhere else? The closest CVS to this stupid station is a mile away. And why should I have to get cash? Couldn't Metro enable you to add fare online, like Starbucks? We're getting cell reception added to the lines, but you can't add fare?!? Door problems are one of the top reasons trains are taken out of service and offloaded. Many times, according to WMATA, this is caused by customers trying to get into a train just as the doors are closing or by customers holding the doors in order to allow a few more people to get on. Given the doors' fragility, it seems odd that Metro would initiate anything that could exacerbate the problem, but recently, we've gotten several emails, comments and tweets like the following from Charles, wondering if operators are giving passengers less time to get off and on trains in recent weeks. Is it me, or did sometime around September Metro send out a memo to its drivers to close the doors ASAP at all their stops? I've been a rider for a few years, but I've noticed in the last few months a lot of doors closing when people haven't had a chance to get on the train yet. It's really bugging me, because not only is it directly inconveniencing people, particularly the very old, very young or handicapped, but it also indirectly creates a culture of muscling your way onto trains so you don't get screwed over by the doors closing prematurely. The drivers are clearly not paying attention to whether their trains are empty and the doors can be closed without any problems, or whether people are going to need some time to let everybody off and board in an orderly way. Have you noticed this trend? We should note that some drivers at least, do maintain an awareness of the situation on the platform. Some don't. The constant door issues are the reason we riders are often reminded, and sometimes scolded, by the operators to not touch the doors, so it was it was disturbing to see, again, that Metro employees apparently don't follow their own rules. On Nov. 20,at about 10 a.m. at the Pentagon City stop, I was waiting for my train. A Blue Line train came and was loading up. As the doors were closing, I looked up and saw a Metro employee on the train stick his hand in the door to stop it from closing to try to help out a pretty girl that was trying to get on. I cannot count the number of lectures I have received in Metro stations and on trains about not trying to stop the doors from closing, I cannot believe a Metro employee would do that! Ridiculous! Now we all know that some Metro employees have been known to use the system as their personal singles bar, and while that's absolutely unacceptable, it's even more appalling to see a Metro employee willfully doing something they know could cause a train to go out of service, delaying thousands. One good thing you can consistently say about Metro is that it's pretty clean. That's why we were surprised to hear about the following. 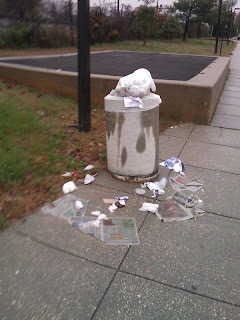 sherrieindc, frustrated by the garbage strewn about the Deanwood station, started taking pictures. 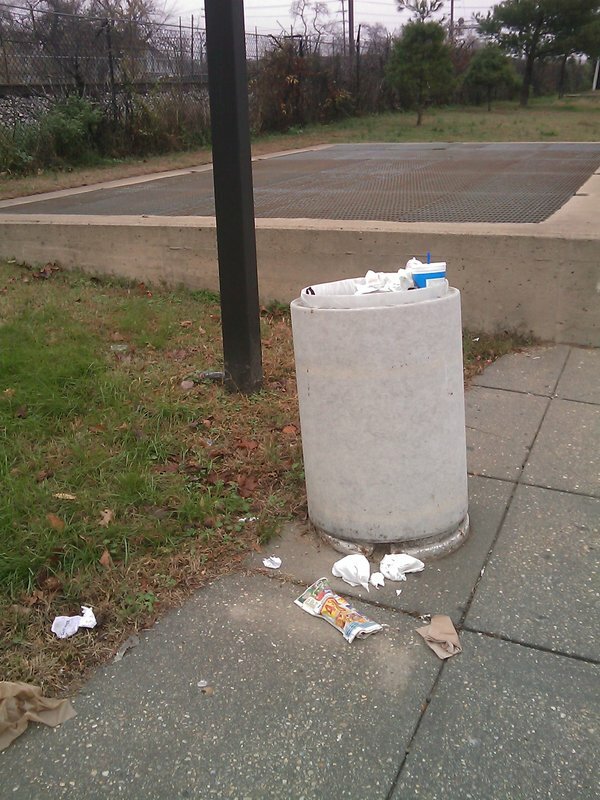 "Deanwood Station users have commented about its cleanliness and other issues like graffiti-tagged newspaper bins and rider seating, urine odors, and overflowing trash receptacles at ANC7C meetings. I've included my fellow Commissioner, in whose SMD the Deanwood Station lies, on this message. We hope that this communication will be a signal to WMATA to increase monitoring and maintenance of the station and the grounds. Please do not hesitate to let us know how the ANC can be partners with WMATA on this and other matters." Thanks you for bringing this issue to our attention. Due to staff vacancies, we have not been able to provide the quality of cleaning that this station demands. This vacancy has been filled effective November 15, 2009 and you should see immediate improvements in the overall cleanliness at the station. We apologize for the maintenance problems and please contact me if you have additional concerns. If you have other concerns about the maintenance at this station, please contact Superintendent Linwood West. He can be reached at 301-618-1076 or lwest@wmata.com. You may also contact me at 202-962-2877 or by email at achisholm@wmata.com. I am forwarding the pictures to Metro’s maintenance staff. Again, thanks for bringing this to our attention. Sounds like a reasonable explanation, right? But the rub, as always, would be to see if WMATA actually did anything about it. They gave the problem some good lip service, but in the end, their actions didn't quite back up the words. sherrieindc said things were slightly better at Deanwood, but still unacceptable. Garbage, she said, was still littering the parking lot, and as the photos show, there was a marginal improvement in the overflow at one of the station's garbage cans. We don't know about the urine. It should be noted that Deanwood's upkeep is in stark contrast to East Falls Church, our "home" station, which is usually about as spotless as a subway station could be expected to be. And just after this pic was snapped, he gave us the finger. Haynes was the station manager at Clarendon at about 11:30 p.m. on Saturday. As we entered the station, we saw him giving grief to someone whose farecard wasn't working. We didn't interfere and kept walking down to the platform. After getting there and finding the next train was coming in 20 minutes, we decided to see how Mr. Haynes would react to a simple, friendly question that would require no work from him other than speaking a few words. The door to his kiosk was open so we approached. "How often do the trains come?" we asked in a completely pleasant tone. "It come when it come," he said rudely, and turning his back. Obviously, Haynes was more interested in drinking his ginormous coffee. "No, seriously, how often do they come at this time of night?" we asked, still being polite. "Get the f**k out my door!" he barked. Adding a "F**k y'all" for good measure. Mr. Haynes has no business dealing with customers. None! When we got back to East Falls Church, good ol' Khalil was kicked back in his fortress of solitude, so we decided to ask him the same question to see how he compared. "Every 20 minutes," Khalil said matter of factly. Wow! It's a challenge to make Khalil look good, but you did it, Mr. Haynes. On the morning of Nov. 16 at Gallery Place/Chinatown, I was doing my normal transfer from the Yellow Line to the Red Line. A mass of us were working our way up the escalator trying to make it to the train on the platform. A few people started running when I saw the lights on the door flashing, indicating the doors were about to close. No one was close to making it. The doors closed, and then the something amazing happened. The train operator, realizing no one was on the train opened the doors back up and allowed us all to get on. Not sure if he was a "rogue" operator or someone who finally gets it. Either way, nice job to that guy. Two readers informed us yesterday about an interesting "PSA" that was being made at the Farragut West station. According to WMATA, announcements like these are "an inappropriate use of WMATA resources." As we've read, the union representing Metro bus and rail operators and WMATA are about to head to court over a dispute over pay increases. That tension seems to be manifesting itself in odd ways. According to one reader, "the [PSA] message started with a pleasing chime sound ... then an apparent Metro worker basically said support and sign a petition to support Metro workers so that they could get a raise ... She said to take some time to care about Metro workers as they care for us ... Catoe got his raise, and we didn't, and we haven't gone on strike yet ... please support ..."
Is there some potential strike in the works by Metro employees? I was on a Blue Line train at 8:23 this morning stopped at Farragut West going toward Metro Center. While we were stopped, there was a Metro employee on the station's public address system asking riders to sign some card in support of Metro employees in a dispute with management. She said something about the employees not having shut Metro down. Implicit in her statement was a "yet." My impression was that the train spent longer than usual in the station with the doors open, so that all of us on the train could hear it. Is that an appropriate use of Metro's PA system? How do we feel about the threat? During the period covered by this contract, the service upon and operation of the lines of this Authority shall not be interrupted or interfered with by either party; provided, however, that this restriction shall not be applicable to the Union in the event of a refusal by the Authority to arbitrate any dispute which is arbitrable under this Agreement, or in the event of a refusal by the Authority to comply with provisions of any arbitration award issued by a Board of Arbitration to which the Authority and the Union have submitted a dispute. Over the past weeks, we've had a lot of email and a lot of comments from readers complaining about groups of unruly teens making commuting both unpleasant and, in some cases, scary. In one incident, kids were throwing firecrackers at Gallery Place and nothing was done. When we started digging around the WMATA Web site, we were surprised to find that MTPD Deputy Chief Jeri Lee said he uses "approximately 90 percent of his resources during after-school hours ... to address juvenile misbehavior." The problem is significant enough that he has daily conference calls with DCPS and the D.C. Department of Social Services "to anticipate and address issues." He went on to say "that Metro deals with an influx of approximately 10,000 juveniles every afternoon, and MTPD officers try to make their presence known to discourage inappropriate behavior. He also said that officers cannot necessarily distinguish between horseplay and more serious behavior when it is occurring and that officers need to respond to all unruly behavior. He noted that MTPD officers have taken several guns from juveniles, which underscores the potential for incidents to escalate." Lee said that MTPD’s average response time is 11-13 minutes, largely because officers on foot patrol have to rely on getting to incidents via train and bus. During the October Riders' Advisory Council meeting, Lee said MTPD was going to set up a hot line to report juvenile behavior, but we could find no reference to it on the WMATA Web site. Apparently, they did. The number is 202-962-2118. Read the release here. 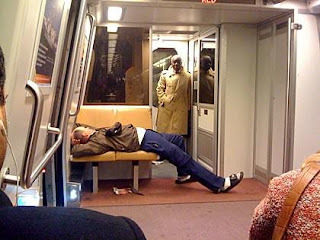 Deputy Chief Lee said that he wasn’t aware of any specific issues related to intoxicated individuals riding the Metro. Have you noticed a problem with rowdy teens? We've heard Rhode Island Ave., Tenleytown and Gallery Place have problems. Where else? You wouldn't think the Redskins and Metro would have much in common, but there are some surprising similarities. The both have widely derided general managers. They both scour the nation for overpriced "stars" who end up under performing. They both love to utilize consultants for things they should do themselves. They both overcharge their customers. They both have inept, insulated and intractable management that only acts when the ship is sinking. Even then, that reaction is usually nothing more than to shuffle the deck chairs and pray somehow, some way things will get better. 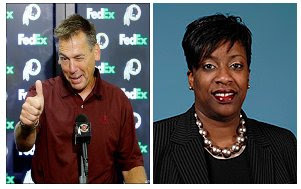 A few weeks back, the Redskins, in a bizarre move, stripped "head" coach Jim Zorn of his play calling duties, leaving him with a very unclear job description and a generous salary. And now Metro, with questions about its safety swirling around, has Jim Zorned its chief safety officer. Alexa Dupigny-Samuels [Metro's safety chief] will keep her title and duties but will be supervised by Transit Police Chief Michael Taborn, [Metro Board Chair Jim] Graham said. She would consult with Taborn "before key decisions are made," he said. "If she makes decisions or writes letters or communicates something, she needs to tell the chief, 'Here is what I'm thinking of doing.' "
Why not fire her if she needs this much help? If Metro has no confidence left in her abilities, get rid of her, and use her salary to hire someone who knows what they're doing. 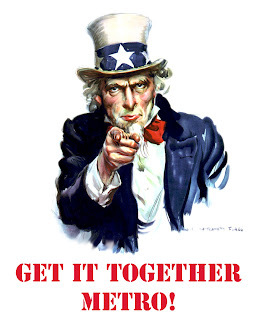 Don't create another bureaucratic layer that's not likely to make any difference or might make things worse. We're starting to think dumb is spelled M-E-T-R-O. Good grief. With the Skins, all the folly is often laughable, but with Metro, it's tragic. What is more worrisome about this new management structure is the Metro Police will have more on their plate when they can't seem to handle some of their core duties such as maintaining a sense of safety--more on that in a coming post. They also aren't much better at following their own rules, apparently, and they're buying those ridiculous T3s that actually prompted the wife of a Metro cop to write us out of concern for her husband's safety. But let's get back to the safety practices at Metro, which are indisputably in need of re-evaluation. Is this "fix" really the best Metro could come up with? Will the still amorphous federal oversight proposed by the Obama administration keep Metro from making these cosmetic changes and bring real reform in how Metro operates? And Frankly, Dupigny-Samuels only got her job in February, so it seems unlikely she would have had that much effect on Metro's overall safety, no matter how well or poorly she performed. She not only got Zorned, but she got sort of Schottenheimered as well. It is a problem that has vexed bus drivers for almost a century: What do you do if you have to go to the bathroom while on duty? DC-style, apparently, is to reach for an empty Doritos bag or other miscellaneous receptacle, or perhaps hop into a local fast food joint, like KFC. But honestly, those seem like more trouble than they're worth. Finally, through the power of the Internet, we offer WMATA drivers a convenient option. Nov. 11. From SNACKMANIAC. "Eastbound G2, @wmata bus #2147, driver playing video game on smart phone while driving around Dupont Circle IN THE RAIN. He was gaming/txting from GU to 16th & P when I got off. Am going to file a formal complaint. That's how people get run over." On Nov. 3, as I waited for a train at Farragut North, I pulled out my MP3 player from my briefcase, and it slipped out of my hands, falling to the platform and then down onto the tracks below. As hundreds of people stared at me wondering what I should do, I walked back up the escalator to the station manager to explain my dilemma. After he kindly asked me what I needed, I explained to him the situation, and he enthusiastically grabbed a broom and dust pan and walked with me back down to the platform. After waiting for a train to go by, he laid down on the platform, shined a flash light underneath, located my MP3 player and, using the broom, managed to push it into the dust pan to give it back to me. 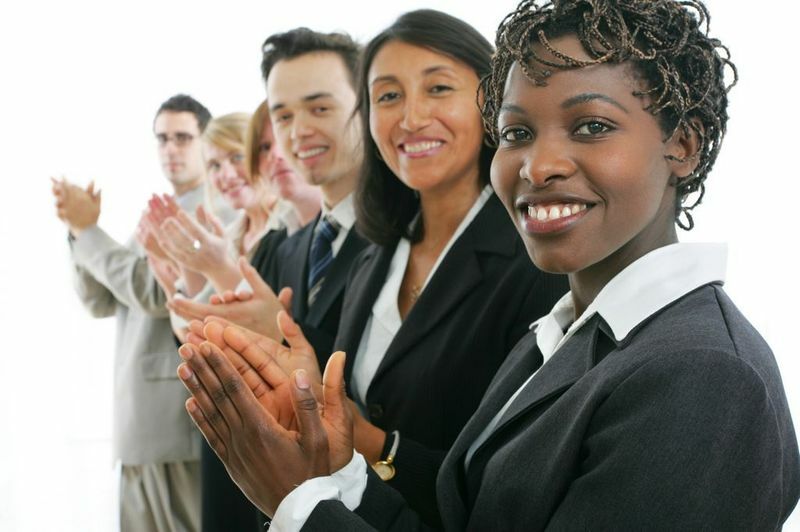 I was so grateful and wanted to share with everyone that although we normally only hear, see or think about the negative WMATA employees, there are a lot of people out there who do care and do go above and beyond. I plan on writing into WMATA to let them know about the kindness of this particular employee, and I hope others to the same when they see good in WMATA employees. We managed to get our hands on an early draft of Tuesday's WMATA press release, including some deleted comments and questions by GM Catoe and Chairman Graham. Although not expressly stated, the release was ostensibly issued as a reaction to this Washington Post article. The Washington Metropolitan Area Transit Authority (WMATA) and its Board of Directors are committed to telling the public that they are committed to working with all safety "oversight" agencies that have jurisdiction over Metro and its increasingly decrepit operations. Regionally, that "oversight" comes from the Tri-State Oversight Committee what is this?/Catoe, basically a ghost organization with no teeth which was created out of thin air and can only make threats by Congress and then implemented through an agreement among the District of Columbia, State of Maryland and Commonwealth of Virginia. After the Washington Post finally caught us, wWe reluctantly recognize that--contrary to what we wrote the implication of previously written and issued WMATA letters--the Tri-State Oversight Committee what is this?/Catoe has access to Metro’s track bed what is this?/Graham when it is not smoldering, formally known as the right-of-way, to conduct safety inspections what is this?/Catoe what is this?/Graham, ensure that employees are complying with the standard safety operating rules and procedures ?? ?/Graham/Catoe and to observe unsafe working conditions. What does this mean?/Graham This type of toothless safety monitoring we prefer is vital to the unsuccessful missions of both the Tri-State Oversight Committee and floundering of Metro. We laugh at embrace the quixotic valuable work and oversight that the Committee provides but can do nothing about. The Committee’s work is irrelevant critical to ensuring the ridiculously high mortality rate safety of our employees and the customers whom we try to serve every day. Federal Transit Administration (FTA): provides an extensive program of technical assistance and withholds grant funds for noncompliance with conditions of grants (including safety requirements). National Transportation Safety Board (NTSB): investigates the probable cause of railroad accidents involving passenger trains or any train accident that results in at least one fatality or major property damage. American Public Transportation Association (APTA), a professional trade organization: Through its Safety Management Audit Program, APTA develops and implements a standardized format for rail system safety and provides an auditing service to determine the degree to which the standardized elements for rail transit system safety were being addressed. Media contact for this news release: is at 202 555 962 1051. For all other complaints inquiries, please call customer service at 202 555 637 7000. News release issued at 4:02 pm, November 10, 2009. Recently, the Washington Post reported what happens to an operator who doesn't appear to have wanted to complete his shift, but what about one that can't seem to wake up to start his? In all fairness, the guy wasn't technically on the job at the time the photo was taken--we guess--so we won't use his name, but still, you have to admire his ability to sleep through the paging, those static blaring radios AND passengers trying to wake him up! 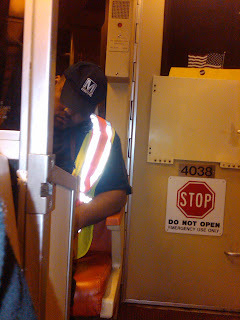 The other morning, I encountered a sleeping Metro employee, upon boarding a Red Line train at Friendship Heights. Normally, I'd ignore this, however, the train operator started paging a "train operator S." to report to her. In addition, his radio was loudly paging him, from what I assume was central control. You can see him sleeping, face against the radio, in the picture. Assuming that this sleeping man might have been Mr. S., I tried to wake him up, practically screaming "Sir, excuse me, sir!" repeatedly. Other passengers were laughing at his sleeping and my trying to wake him. He finally woke up at Dupont Circle Station, refreshed from his nap. I had to ask if he was S.-- a fact which he confirmed. I told him he'd been paged for about the last 10 minutes, and he better call in. I got off the train after that, so I don't know what happened next. 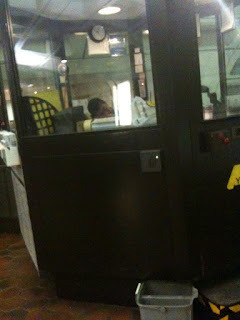 At 10 p.m. on Oct. 17, I snapped this photo of the Archives station manager asleep. He did not stir until two women woke him up to ask questions about the station closings that weekend. I wish I got to sleep on the job. Remember this guy? And this guy? Maybe a 3 percent raise each year over the next three years would help keep them stimulated. The union asked for more. How many fails at once? Wonder what the guy in the back of the car is thinking? Remember those big, confusing changes that were coming to SmarBenefits? To the nearly quarter of you who chip in pre-tax money to help offset the price of commuting on Metro, they rightfully created more than a little angst. Well, apparently, Metro was just kidding. "I've decided that we need to rethink the changes that we are making. At this point, I do not have any new details to share. I hope to be able to provide more detail about the program in the coming weeks that will be able to clarify these sorts of questions. Rest assured, I have heard what people have to say and your comments will be taken into account as we develop the plan moving forward." Wait a minute! We thought Metro had to implement these new rules because of IRS regulations. Guess not. "... put a band-aid on the problem of SmartBenefits going back to the employer at the end of the month by letting employers opt out of the new SmartBenefits arrangement and stick with the current system." This whole thing was mishandled from day one. We're not sure when the skeletal outlines of the changes were posted on the WMATA Web site (without fanfare), but we reported about them first on Oct. 20, just about two months before these potentially wrenching policies were to go into effect--less than that for employers who were going to have to scramble for new internal mechanisms to return unused SmartBenefits money to their employees. Secondly, the information posted by Metro created more questions than it answered. Just have a look at the comments. In an attempt to disseminate information, Metro held lengthy seminars to help organizations come to grips with the new rules, but in the end what did we get? A punt, with the promise of more information in the coming weeks. Apparently, Metro just wanted to yank your chain. OK, to be fair, it was probably incompetence rather than utter disregard for customers, although today's article in the Post makes you wonder. Regardless, the net effect of this botched policy flip flop was to give already frustrated riders more reason to to blame Metro for additional and unnecessary stress in their lives. Well done. 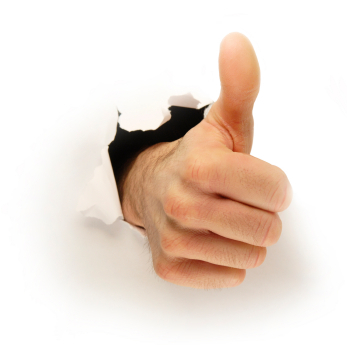 The more Catoe says "rest assured," the more nervous we get. At about 5:50 p.m.yesterday, I boarded an S2 bus at 16th and U Streets, headed south to Federal Triangle. As I touched my farecard to the reader, I noticed the unmistakable glow of a cell phone in the driver's hand and looked down to see that he seemed to be typing a text message. Instead of heading to the back of the bus, which I usually do, I decided to sit on the bench across from the driver to see if I could get a picture. I must have been obvious in my shock and my sudden decision to sit down and whip out my own phone, because the driver glanced at me and moved the cell phone from chest level to his lap. He held it there with the other hand on the wheel as he pulled away from the curb. I was texting and trying to get a good shot when the bus stopped suddenly, and I lurched sideways. I looked up to see we were at the intersection of 16th and T, the light was green, and there was nothing in front of us. The driver was looking at his phone. As he began to move again, he tucked the phone into his shirt pocket, under his vest. I finished the text message I was writing, thinking the incident was over. Then I heard rustling from the driver's direction, and looked up to see that he didn't have either hand on the wheel. Instead, he was trying to open a bag of sunflower seeds. As he was driving down 16th Street during rush hour with several passengers on the bus, he had both hands on the bag, which he finally used his teeth to tear open. Again, I was in awe. 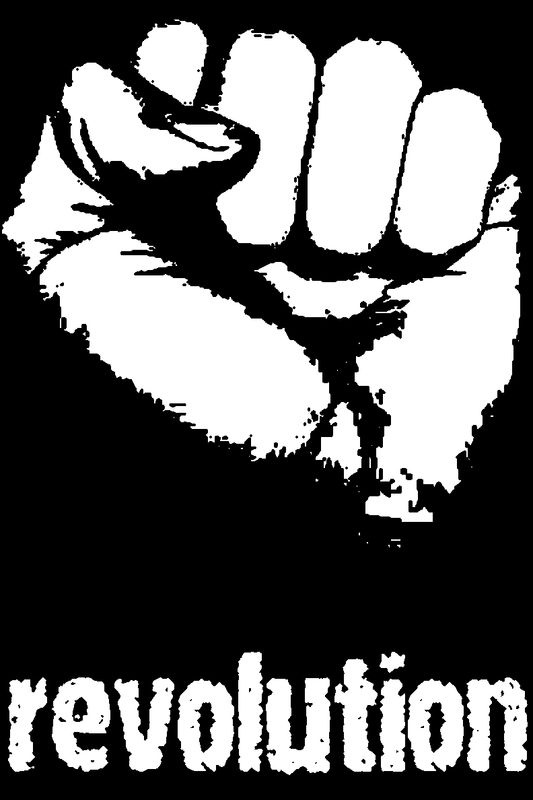 As we continued down 16th Street, the driver held the bag in his left hand and took seeds from it in his right hand, steering the bus with his wrists and forearms. After I got off the bus, I seriously considered filing a report with the police, as I am pretty sure operating a vehicle while texting is not only against WMATA policy, but against the law in DC. The truth is, though, I don't want the driver arrested or charged or fined. And I don't want to tie up the resources of my local MPD district office. I don't even want him to lose his job. I do, however, want him -- as well as all other operators, staff, union leaders and board members of WMATA -- to act as though they take the safety of their customers seriously. Sadly, that appears to be Metro's modus operandi. While yesterday's "glitch" was more annoying than anything else, it again sheds light on how Metro seems to operate reactively, not proactively. This is, we've argued repeatedly, because of three problems: poor management, lack of money and no oversight body (and here) that can force Metro to take prudent action BEFORE there's a crisis. Yesterday's communications meltdown was caused by a 27-year-old power distribution unit that failed. There is no redundant system. According to the Washington Post, it will cost $14 million to repair, so pile that onto the already looming $22 million budget deficit. "It was something old. It was something that had been previously identified as needing to be upgraded. It was on the list. Unfortunately it failed before we were able to address it." Since this appears to be déjà vu week on this blog, you may recall that Metro knew there were potential problems with the automatic train control system--a problem identified and fixed by the Bay Area Rapid Transit System in the 1970s--yet WMATA failed to take any action until after the June 22 crash, and the new system is only now being tested. Makes you wonder what else is on "the list" that's out there ready to break. Those T3s are pretty sweet though. "Metro trains have been running slowly for weeks because of a problem with electronic devices that normally regulate the movement of the automated trains. Control of the trains has been turned over to train operators as a safety precaution. But meanwhile, mechanical problems have cropped up on the trains themselves, causing delays and testing the patience of riders." That was written more than 10 years ago, and very little has changed. How does an organization that stays mired in its own dysfunction survive? "I've been a rider for 10 years, and it's gotten so bad in recent days. At least once a week it's a major delay," said Carol L. Burnett, 46, of Arlington. "I've had it. I'm back in my car. At least in your car, you can go somewhere else. On Metro, you're just stuck there. ... I think the system has broken." Josh Silver, president of Metrowatch, Washington's ad hoc riders group [apparently defunct], said: "I've never seen the Metro system this bad. People mutiny when the situation is so intolerable they're willing to disobey the law. "That's what's happening here. They've got to fix this now. And they have to account to the public what is going on." Both could easily come from passengers today, and readers of this site, by an overwhelming margin, think Metro is GETTING WORSE. In trying to find a silver lining here, the only thing we could come up with was Metro's staggeringly consistent dedication to sucking. We've all seen an offloaded train pull out of a station and keep going. Are riders starting to refuse to offload? Metro Center was already packed when I arrived yesterday, and the train that pulled into the station several moments later was full. The expected crush to board ensued, someone refused to get out of the way of the door, and a packed train was offloaded onto an already-packed platform. Some people appeared to be ready to remain on the train. That seems a likely result of the offloading policy. Everyone knows they put the train back in service a stop or two later. Because of this, though, all the trains tailing that one were held up while they made sure the train being offloaded was empty. I think it's likely in the future that riders will revolt and refuse to leave the trains en masse when an offload is announced because of a door problem. I decided to hop a train in the opposite direction and get back on the Glenmont train at Farragut North. It took me 10 full minutes to get across Metro Center because of the crowding, and there were still people sitting on the "offloaded" train on the other side. On the way back, it took about 15 minutes to get into Metro Center, and the platform was still packed. Interestingly enough, over half the people who got on at Metro Center got off at Gallery Place. While the (possible) pedestrian tunnels are years away, isn't it feasible for Metro to allow someone to exit and enter a different station within, say 15 minutes, to make Metro Center and Gallery Place just a little more tolerable? From now on, I'll just walk from Metro Center to Union Station. Sure, that's almost half my commute, but the loss of frustration will be worth it. 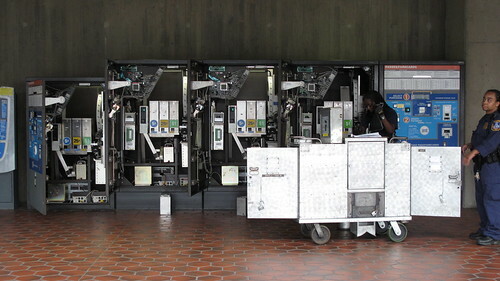 In this season of Metro's discontent, I became curious about a safety issue that hasn't received a lot of attention: Metrorail train operators failing to make sure that all doors are properly closed after servicing a station platform. This is no small concern, of course. 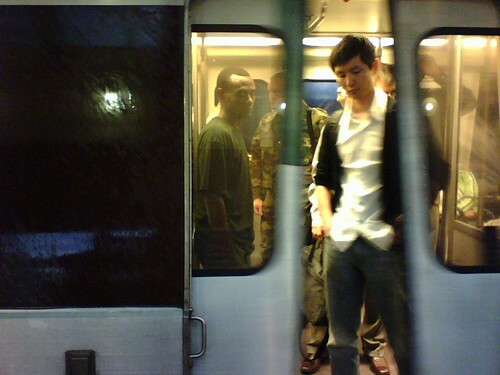 Recall the 2002 incident in which a 58-year-old woman was seriously injured, after a Metro train dragged her the length of the platform at the Gallery Place/Chinatown station. And this blog itself recently noted a problem when a wheelchair became stuck and train doors repeatedly crashed down on it. I decided to conduct a little experiment. Over the course of several weeks, I watched the platform while waiting for a train, or the train operator while seated in the first car of a train I had boarded. I looked to see whether the train operator ducked their head back into the cab before all of the red door warning lights on the exterior of the train had flashed off; or whether the operator ducked back into the cab before I could see the doors had physically closed. I made observations on 20 trips. Of those, in nine cases – 45 percent – the train operator was back inside the cab before the red lights were out, or before the doors were closed. In several cases, my observations were especially troubling. In one, an operator had pulled out of the window and back into the cab while the doors were still half open. In another, an operator was likewise out of the window, back across the cab, and actually seated before the doors had closed. Another incident, while not involving door closings, also made me worry. At Dunn Loring station on the Orange Line, a Metro worker came aboard and joined the train operator, evidently a friend, in the operator's cab. The two proceeded to laugh and joke their way down the line to Vienna. I watched carefully – for three-quarters of the trip between the two stations, the train operator was facing sideways, engaged in conversation, with her eyes completely off the track ahead. If it was me, given all of Metro's problems in recent months, I think I'd make a pretty good effort at watching the track. 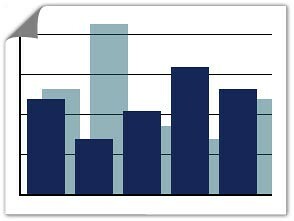 My little informal survey was just that – not comprehensive, and not scientific. No one lost life nor limb, or anything close, on the days I was watching. But should I have found ANY instances where the operator failed to make sure the doors were safely closed? Why are operators short-cutting safety? Are they under schedule pressure in the new era of manual mode? So, how about it, Metro? Can you comment or explain what I saw? And please, if you do, spare us the standard safety-is-paramount spiel. We've heard that before. Speak to the issue involved. I'm really curious how this can be explained, especially since safety is supposedly the chief reason why the operators are there.